With the fried goods from the Deep Sea having miraculously brought about a return to nearly full constitutional health, I headed out at lunchtime, today, to explore more of the seam of sandwich places I found on West Nicholson Street, the other day. 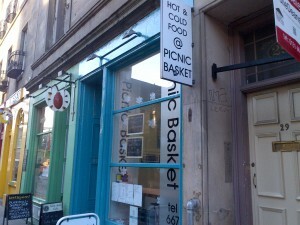 Next door to Beetlejuice is the Picnic Basket, a neat and bright little place, focussed on the takeout market. It serves a good range offerings, from which I was content to choose. Sandwiches are made to order, with a board of suggested combinations alongside the freedom to concoct your own flavour party. One from the board called “Scottie” that featured smoked salmon and cream cheese sounded rather good, so I opted for that, giving the sandwich creation half of my brain a rest for the day. I accompanied the roll with a large portion of soup, choosing mushroom over lentil, from their daily selection of two. The soup was a creamy delight, full of strong mushroom flavour. It was a richly enjoyable lunchtime treat. The roll didn’t score quite the same success. The roll itself was fresh and soft, and the salad bright and crisp, but the smoked salmon wasn’t the most thrilling I’ve tasted. It got a little lost in the plentiful bread and cream cheese, adding only whisper notes of smoky goodness. It was a good sandwich, for sure, but it could have been much better. 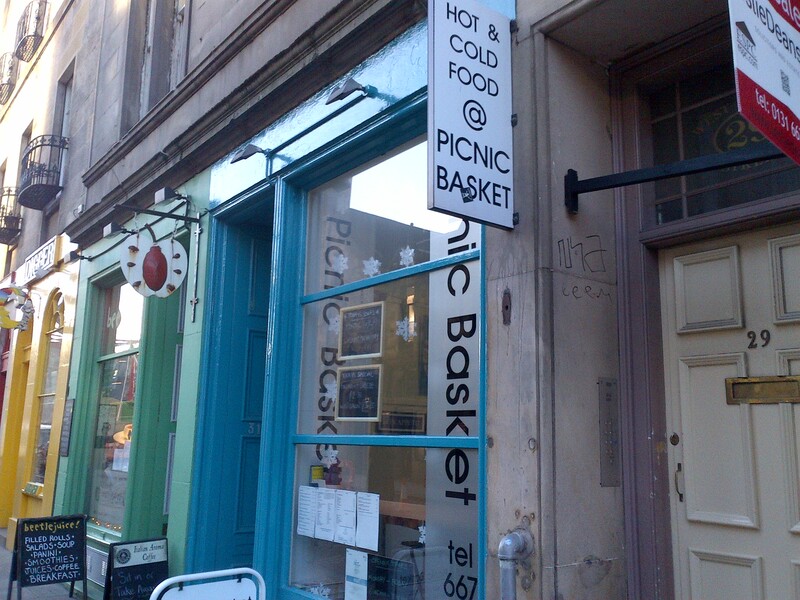 So I was pretty pleased with the Picnic Basket. 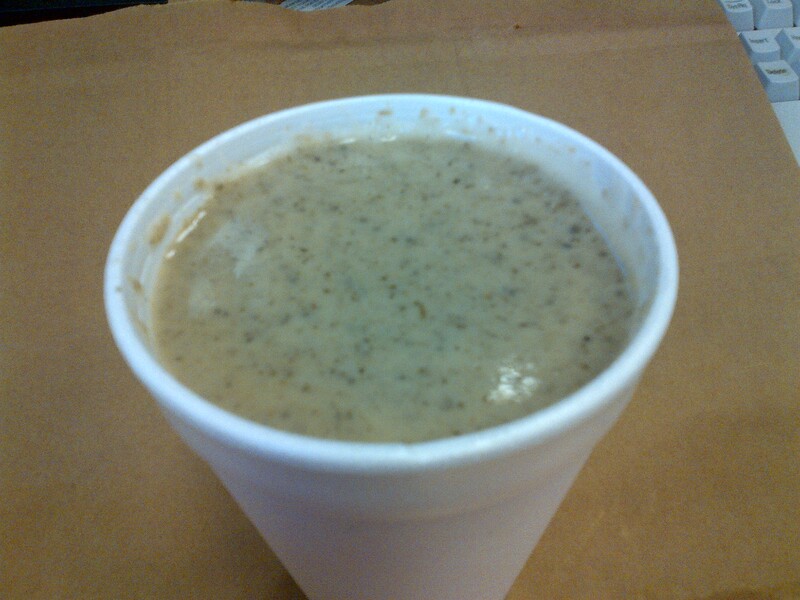 Mushroom soup is a particular favourite with me, and this was a fine example. 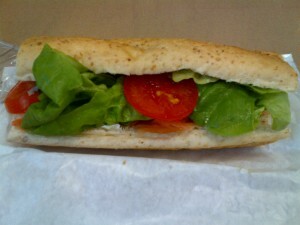 The sandwich promised a nice combination of flavours, but the execution and ingredients didn’t quite match up. I’d happily head back to the place, though, as service was efficient, and it provided me with a set of satisfying soupy sensations.